Following Claus's excellent tour de force yesterday on the various level's of double-bind that now seem to be facing the ECB, I'd just like to chip in to the overall picture with a bit of country level detail. Investor confidence in Germany fell in April for the first time since January on concern that faster inflation, a stronger euro and fallout on exports from slowing economies in Italy (see detailed analysis here) and Spain (see here) will hurt company earnings. 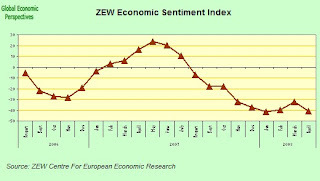 The ZEW Center for European Economic Research said yesterday that its index of investor and analyst expectations declined to minus 40.7 from minus 32 in March. This was just above the 15-year low of minus 41.6 it in January. The euro dropped more than half a cent to $1.5828 at 11:06 a.m. in Frankfurt following release of the report while the DAX index retreated as much as 25 points to an intra-day low of 6532.76. Germany's benchmark DAX share index has dropped 19 percent this year, the biggest decline among major European stock markets, as investors grow steadily more nervous about the robustness of the German economy to the increasing difficulties which are encircling it - "am I to be the one to keep my head when all those around me are losing theirs?". So while in real data terms growth in Europe's largest economy still seems to be holding up, the outlook is now evidently deteriorating. In a further indication of the steadily changing conditions the German Credit Reform agency reported on April 1 that aroun a third of medium-sized German companies are already finding it more difficult to get loans. And at the interbank level the cost of borrowing euros for three months rose to 4.75 percent on Monday, the highest level since Dec. 27. 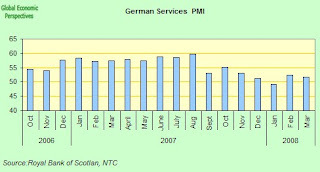 The rate of expansion in German services growth slowed a little in March, as the services purchasing managers index dropping to 51.8 from 52.2 in February. Still German services continue to expand, and this gives us one measure of the extent to which the German economy had up to now shown itself able to resist. The rate of expansion is now much weaker than before August 2007, but there is still expansion. 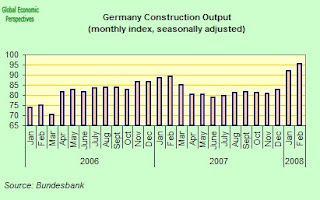 German industrial production has also proved reasonably robust in recent months and rose one more time in February, giving its third monthly gain in as many months, as manufacturing output continued to hold up and unusually warm temperatures boosted construction. Output rose a seasonally adjusted 0.4 percent from January, when it gained 1.4 percent, the Economy Ministry in Berlin said last week. Year on year total industrial production was up 6.1 percent when adjusted for the number of working days. Construction output also rose in February - up 3.7 percent on the month. Manufacturing production increased 0.3 percent and output of semi-finished goods rose 1.6 percent. Investment goods production however declined by 0.2 percent month on month. German retail sales, however, had their biggest month on month fall in almost a year in February as faster inflation eroded consumer spending power. Sales, adjusted for inflation and seasonal swings, fell 1.6 percent from January, according to data from the Federal Statistics Office. That's the biggest drop since May 2007. 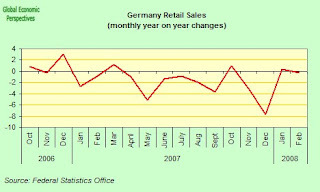 According to provisional results of the Federal Statistical Office, in February 2008 turnover in the German retail trade was up in money terms by 2.4% and down in real inflation adjusted terms by 0.3% over February 2007. There was even one extra shopping day in February 2008 (25) as compared with February 2007 (24). 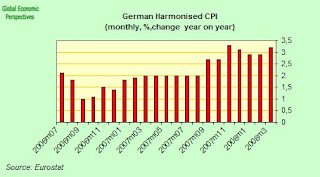 So German consumption is a long way from driving the German economy forward at this point. Companies and consumers are also hard at it grappling with higher energy and food prices, which drove Germany's inflation rate to 3.2 percent last month. Crude oil prices have climbed 76 percent over the past year, reaching a record $114.95 today. So what we have left here are exports, which are reflected in those steady industrial output numbers, and on the plus side German exports in February remained unchanged from January, suggesting that Europe's largest economy continued at that point to resist the force of the global slowdown and the rise in the euro, but adding export on-top-of export may now be getting to be a harder and harder thing to do. Even more to the point, a change in the distribution of German exports is taking place on the margin, since while the pace of expansion to EU countries slowed from 7.7% in January to 6.7% in February, the pace of expansion to non EU countries (and we could think here in particular of Russia perhaps) rose from 11.5% in January to 13.5% in February. So rising demand in Russia (and to a lesser extent China) is making up for declining demand from Spain and Italy as these economies slow. All of this is now a delicate balancing act, and we will need to watch carefully what happens in March and April. German sales abroad, when adjusted for working days and seasonal changes, were unchanged in February from January, when they rose 3.6 percent. Imports were down a seasonally adjusted 0.4% from January, reflecting the fact that internal demand in Gemany could hardly be called "vibrant" at the present time. Exports rose 9 percent year on year, while imports were up 7%. 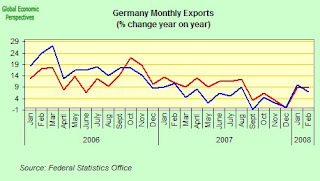 What really matters about German exports is their general distribution and comparative rates of growth. The numbers for China were up from 27,520.6 million euro in 2006 to 29,922.7 million euro in 2007, an incease of only 2,402.1 million Euro (or 8.7%) while exports to the Czech Republic went up from 22,255.3 million euro in 2006 to 26,026.6 million euro in 2007, an incease of 3,771.3 million Euro, or 16.8% (proportionatley about double the Chinese increase at). So we can say that the Czech Republic is just about as important a customer for Germany as China is, and more importantly Germany has more vulnerability to economic slowdown in the Czech Republic than it does to one in China. The United States has been declining in importance for German exports, and is down from 78,011.4 million euro in 2006 to 73,356.0 million euro in 2007, that is a decrease of 4,655.4 million Euro or 6%. Poland on the other hand is way up - from 28,820,4 million euro in 2006 to 36,083.2 million euro in 2007, that is an increase of 7,262.8 million Euro or 25.2%. Hungary is also up - from 15,870.8 million euro in 2006 to 17304.9 mi,llion euro in 2007, that is an increase of 1,434.9 million Euro or 9%. So another way of looking at this is that Poland, the Czech Republic and Hungary between them are now - at 79,414.7 million euro in 2007 - more for German exports than the United States - with 73,356 million euro in 2007 - is, which I think is really quite incredible. Spain was up from 42,159.2 million euro in 2006 to 48,157.7 million euro in 2007, an increase of 5,998.5 million Euro or 14.2%, while Italy was up from 59,971.4 million euro in 2006 to 65,148.0 million euro in 2007, an increase of 5,176.6 million Euro or 8.5%. Again Spain and Italy are also between them more important for Germany than the US is, and it is of course these two economies that are now slowing significantly. The Russian Federation on the other hand continues to expand rapidly, and was up from 23,371.8 million euro in 2006 to 28,185.2 million euro in 2007, an increase of 4,813.4 million Euro or 20.6%. Now Hungary is a rather interesting case in point here, since it has a fairly open economy with external trade (exports plus imports) now representing 155% of gross domestic product. Hungary is also itself increasingly dependent on exports, since there is a recession in internal demand following the introduction of an austerity programme in the autumn of 2006. 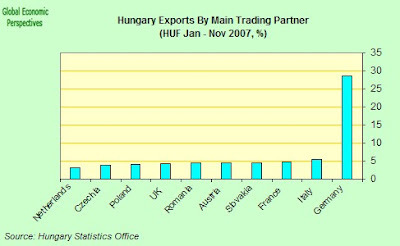 And, guess what, Hungarian trade is incredibly interlinked with Germany, and nearly 30% of Hungarian exports now go to Germany. 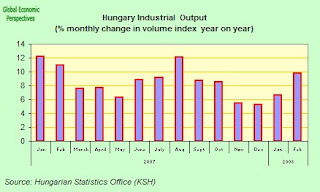 Also Hungary's industrial output has been doing pretty well over the last couple of months, jumping by 9.8% over February 2007 on a working day adjusted basis. Output also increased reasonably well in January, following rather weaker numbers in November and December, numbers which really rather mirror what was happening in Germany at the time. If we look at the chart for Polish industrial output, we can again see a surge in February, with industrial output at an annual 14.9 percent rate, up from 10.8 percent in January. And again the Czech republic looks pretty similar, with industrial output growing by 11.3 percent year-on-year in February, compared to a 9.3 percent rate in January. Curiously, and I'm not sure at this point whether this is simply a coincidence or not, the central banks in all these three countries have been busy raising base rates in recent months. On the other hand this recent acceleration is unlikely to be of long duration. We may see the surge continue, but I doubt it will run many more month after that, and I read the ZEW index reading in just this sense. 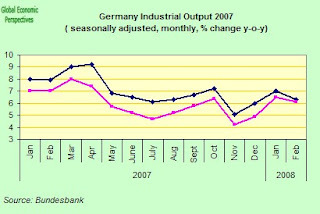 In addition German manufacturing orders declined for the third consecutive month in February. Orders,adjusted for seasonal swings and inflation, fell 0.5 percent from January, when they dropped 0.7 percent, the Economy and Technology Ministry said earlier this month. Export orders were down 1.1 percent in February from January while domestic orders were unchanged.. In the first two months of the year, orders fell 1.5 percent from the previous two-month period. “The latest Euro Area economic indicators were surprisingly strong, suggesting that Hungary's main export partner (Germany) is so far in good shape and that the effects of the US slow down and rising credit costs are limited. We expect a broader Euro Area weakness in the second half of the year, which is likely to limit the Hungarian growth recovery due to weaker net exports." And as Hungary goes, so goes Germany - or vice versa if you prefer, since the level of circular causality running through German growth and growth in the East European economies we have been looking at is now very strong indeed. My personal feeling is that the German economy data now needs watching very carefully indeed. The weakness is evident, despite the valiant effort we have seen to hang on in there. The slowdown in Italy and Spain will undoubtedly take a toll on exports, and possibly the UK will act as a drag too. I don't think it needs too much change in export growth on the margin to start to tip this all over, since export driven economies are often not the most stable of beasts. The next key data point will be the manufacturing purchasing managers index reading for April which is due out at the start of May. This should tell us a lot about what is happening NOW, as opposed to what was happening two or three months ago. In the world of macroeconomics these days a month, and even a week, is often a long time. Far from the IMF being "pessimistic" I think there are strong downside risks to the IMF forecast, and especially if problems start to emerge in those Eastern European economies on which Germany is now, as we have seen, very dependent for export growth. Is The End Of Oil-Driven Growth in Sight in Russia? Leonid Fedun, the 52-year-old vice-president of Lukoil, Russia’s largest independent oil company, told the Financial Times he believed last year’s Russian oil production of about 10m barrels a day was the highest he would see “in his lifetime”. Russia is the world’s second biggest oil producer. 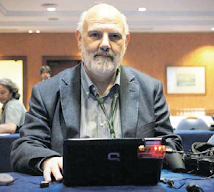 Mr Fedun compared Russia with the North Sea and Mexico, where oil production is declining dramatically, saying that in the oil-rich region of western Siberia, the mainstay of Russian output, “the period of intense oil production [growth] is over”. Now this whole situation is of interest not only for the potential implications for global oil spully and prices, but for light it sheds on Russia's short to medium term trade and current acount balance situation. 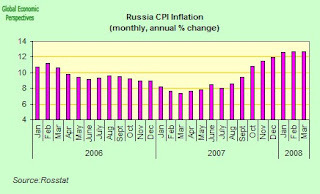 Russian consumer prices rose in March at the same annual rate as in February (12.7%), led by bread, vegetables and other food costs. Prices rose 1.2 percent from February, according to data from the Moscow-based Federal Statistics Office. 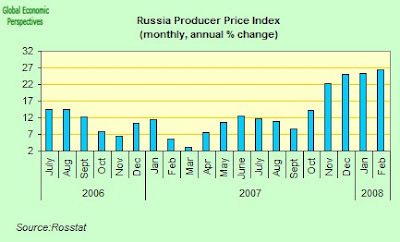 Russian prices have already risen 4.8 percent so far this year (January to March). And producer prices are also rocketing, increasing by 26.4 percent year on year in February, the fastest annual rate since December 2004, and up from 25.2 percent in January, according to data from the Federal Statistics Service. Prices rose by 0.6 over January. Clearly with oil exports possibly about to stagnate, and relative prices tilting so swiftly to Russia's disadvantage, the longer term balance of the external trade account has to come under scrutiny. The Russian government's is attempting as best it can to drain liquidity from the system to try to stem the imflation haemorrage, and the budget surplus was running at 6.6 percent of gross domestic product in the first quarter, accrrding to Finance Ministry data. The surplus rose to 548.94 billion rubles ($23.41 billion) from 416.7 billion rubles in January-February. Revenue reached 1.9 trillion rubles, or 24 percent of the amount the government planned to receive for 2008, according to the statement. Spending was 19 percent of planned expenditures for the period. And as if to add strength to his warning Energy and Industry Minister Viktor Khristenko has announced that Russia is going to cut taxes on oil companies to counter what he terms production "stagnation" following a decade of growth, "The output level we have today is a plateau, stagnation," Khristenko is quoted as saying "We hope the debate on tax changes will be complete within two or three months." Output is set to fall this year for the first time in a decade as producers struggle with soaring costs and aging fields. Production in Russia, which is the world's the largest oil supplier after Saudi Arabia, declined 1.3 percent in March to 9.76 million barrels per day compared with March 2007. Natural Resources Minister Yuri Trutnev warned last month that 2008 could see a drop in output for the first time since 1998.